50 groups, huh? That gives me more respect for my Clavinova. Who would have imagined? Walking up the keyboard does not feel so bad. So for a complete sample set we are looking at 1 terabyte of uncompressed data? Wow. 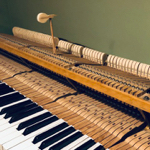 The piano is rigged with all those computer activated solenoids. The whole sampling process can be completely automated. Just go on holiday for a few weeks, come back and voila! Fascinating. Whatever compression they use gives undetectable latency on my Core 2 Duo 2.4Ghz, with all samples preloaded. I feel very connected. I can make it "scream" on those fortes, whereas my CVP feels slightly muted or capped. Last edited by NikkiPiano; 04/21/10 06:32 AM. It is indeed lossLESS compression - it says so right on the product web page! Doh! I say again - very impressive. Perhaps they have found a way to exploit the similarity between velocity layers, for example. Maybe a type of delta compression, in the same way we I-P-B frames in mpeg? RE: the latency of the compression codec, that's largely irrelevant for this kind of application. The reason is that the first part of every sample would be pre-decompressed and loaded into RAM, and as it is being streamed, the next portion would be loaded and de-compressed, so that it is already decompressed by the time that portion is required, and so on. The latency, or CPU stress test, I'm talking about is playing a fast piece with sustain. The real-time decompression doesn't appear to incur any penalty and that's with 1200 samples per key. Insane. CyberGene that is indeed a good test. But I played around with it this morning on the Pianoteq demo and couldn't convince myself that I would be able to hear it reliably. NikkiPiano, I hate to be a pest, but could you pump the output level of the piano up by about 9dB? 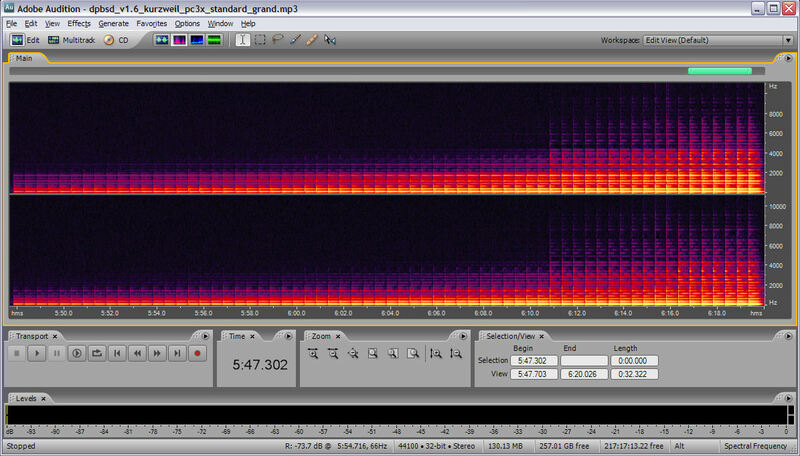 The levels in that MP3 file are rather low - the tails of those nice long decays are ending up in the mosquito noise. Well, actually I may be wrong about Pianoteq supporting it, maybe it's because Pianoteq is modeled and I expect each piano feature to be available there but I have in my memory that I have tested it once and it worked. I will try tonight at home. You have to use loud and high note to observe it. I'm not sure how you increase it by 9dB, but I've increased the level in Ableton from 0 to 6, whatever that means! You may not like it. The second loud section is clipped. I have all the applications open to run it again in case this is not suitable. Last edited by NikkiPiano; 04/21/10 10:24 AM. I think I can hear it in Pianoteq, but it's so subtle and faint that I'm not sure I could reliably say yes/no in my analysis of other DPs. I'm not sure how you increase it by 9dB, but I've increased the level in Ableton from 0 to 6, whatever than means! You may not like it. The second loud section is clipped. I have all the applications open to run it again in case this is not suitable. Yes, I see clipping too. Could you turn it down until there is no clipping? The levels in your v1.5 file were pretty good, but the first v1.6 they were low by ~9dB. OK, I'll turn it down until I see no flat lines. I gradually lowered the volume until the highest peak stopped touching the "ceiling" in Ableton. There must be an automated way of doing this. I'm not sure if the visual representation of the wave is accurate in Ableton Live. Compressed using Audiograbber with Fraunhofer IIS. NikkiPiano, there should be a function called "normalization" in audio files that should do the trick. Best is to record in a clipping secure level within Ableton (24bit) and then normalize it to e.g. -1dB and then convert it to 16bit and save it as a regular MP3. I'll have a look now. I'm doing a quick google to see how this is done in Live. It's a button staring me in the face. This is very useful information when I come to record my performances. Last edited by NikkiPiano; 04/21/10 12:38 PM. Much better, and the noise floor is much whiter now, thanks! Mainly just some fine tuning of the key down sympathetic resonance test. Please use this file instead of all previous versions. - Changed key down sympathetic resonance test, stimulus is now C2, keys now lift in low to high order. - Changed all octave numbering to conform to ANSI standard (C4 = middle C = MIDI note 60). NikkiPiano has kindly submitted a DPBSD MP3 of the VSL Vienna Imperial for our analyzing and listening pleasure - thanks NikkiPiano! This is a reportedly massively sampled Bösendorfer Imperial. 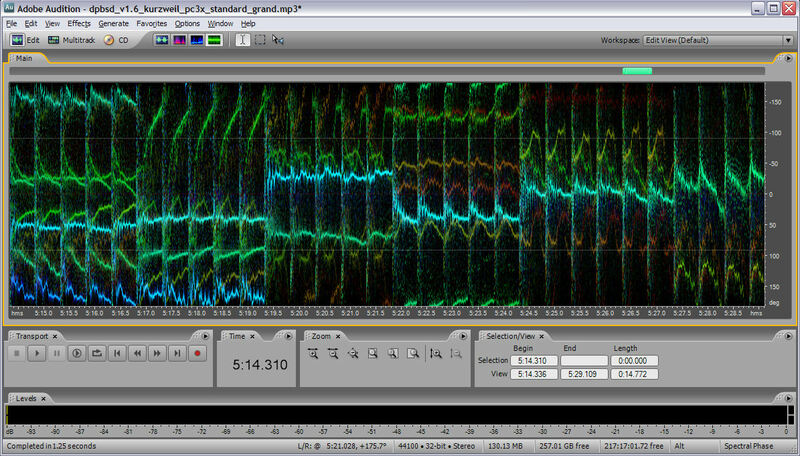 As you might expect, I couldn't detect any obvious looping, just nice long natural sounding string decays. One very interesting thing is there is no detectable velocity layer switching either - either there are different samples for each velocity (note: the DPBSD MIDI file only samples odd velocities of a single note) or there is some kind of sophisticated layer blending going on. Either way, the velocity implementation is refreshingly free of jarring steps, and has a smooth realistic timbre variation with velocity. As bkmz discovered first, this instrument is stretched, which is a shock for a such a reportedly massive sample set. I'm at a loss to explain why stretching exists when the sample set was allowed to get really huge in order to accommodate a myriad of other features, many of which I would put farther down the list of priorities than full sampling. At least there are a lot of stretch groups (I count 53) and none of them are larger than 2. Other than apparently no support for partial pedaling, the Imperial passes all tests associated with pedals and keys. The key down sympathetic resonance only seems to work for the key lower than the stimulus, and is a fairly subtle feature. Because it is sampled, the pedal down sympathetic resonance is very realistic. Review below, MP3 and more analysis pics at the share point. Spectral pan view of the stretch test, middle notes shown here. Stretching is similar over the low and high note regions. 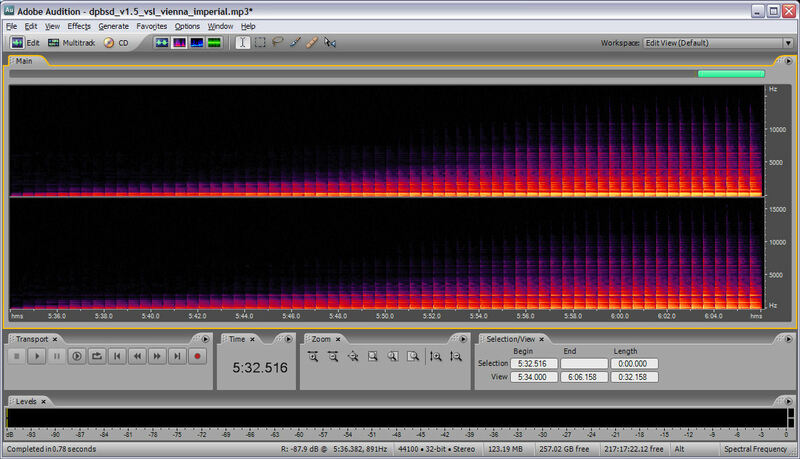 Spectral frequency view of the layer test. Very smooth timbre variation with no visible or audible steps. 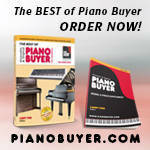 - This is a sampled Bösendorfer Imperial 290-755. - Default "close" setting with reverb off. - Ableton Live, Sony Vegas for MP3 compression. - Passes the pedal down sympathetic resonance test. 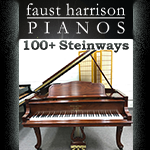 - Beautiful sounding sympathetic resonance. - Passes the key down sympathetic resonance test, though effect is subtle. - Realistic "buzzy" string damp sound. - Pedal up/down sounds a nicely done "loom of strings". - Passes the pedal down silent replay test but the vel=1 note is audible. - Passes the brief pedal partial damping test. - Beautiful long note decay. - Velocity layer switches not visible or audible, either tons of samples or blended. - Large dynamic range (45dB, vel=1:127). - Fails the partial pedaling test. - Visibly and audibly stretched. - Stretch distances: 1,2,1,2,2,1,2(x3),1,2,2,1,2(x3),1,2,2,1,2(x3),1,2,2,1,2(x3),1,2(x3),1,2,2,1,2,2,1,2(x3),1,2,2,1,2,2,1(x3) = 53 groups. - C6 sample has a "thump" sound @ ~2sec. - MP3 levels: peak @ 0dB, noise floor @ -90dB. The reviews just keep coming! Recently pkdd sent me a DPBSD MP3 of the Kurzweil PC3X, "Standard Grand" patch - thanks pkdd! This is one of the most stretched DPs I've encountered, a mere 15 stretch groups covering 88 keys - quite visible and audible. The note decay is also very fast. The looping is rather interesting, they seem to have somehow reduced the beating sounds, which makes a much shorter loop possible. As a result it was difficult for me to ascertain actual loop lengths. 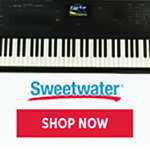 Visually, the notes appear rather similar to those of the Yamaha CP1. The attack phase of the notes are rather short. The three velocity layers (for C4) are very visible and audible as well, with no filtering or blending going on to ease the transition. I couldn't hear anything in the way of pedal down sympathetic resonance, which is unusual. Text review below, MP3 and more analysis pics at the share point. Spectral pan view of the note C3. Note lack of loop detail. 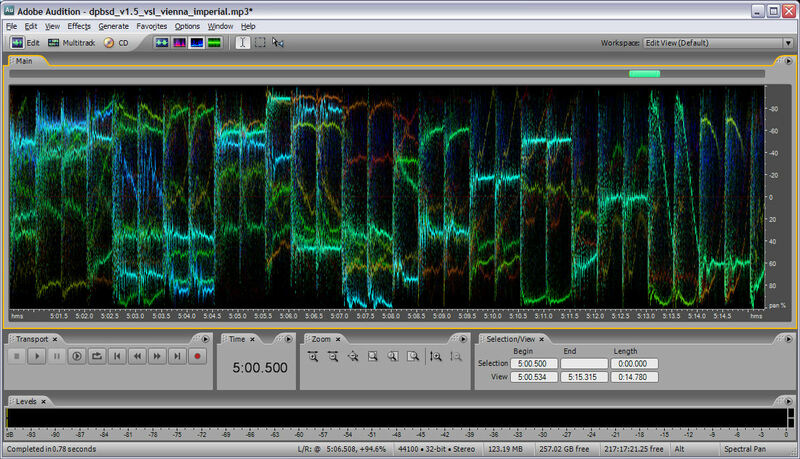 Spectral frequency view of the layer test. First switch at velocity 94 very visible and audible. 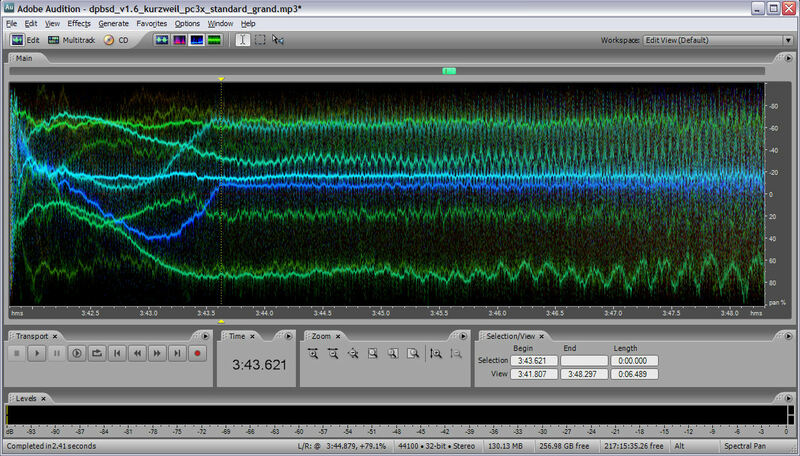 Spectral phase view of the stretch test, middle notes shown. Stretch groups are quite large. - Passes the pedal down silent replay test but vel=1 note is audible & some damping @ pedal up. - Decent dynamic range (~29dB, vel=1:127). - This appears to be a 3 velocity layer unblended sample set. - I can't hear any pedal down sympathetic resonance. - The key down sympathetic resonance sounds like reverb. - Fails the brief pedal partial damping test. - Fairly short decays on the order of ~1/3 to ~1/2 Pianoteq. - Looped, attack lengths rather short, loop lengths mostly indeterminate. - Attack sample lengths are (C1:C8): 1.5,2.0,1.8,1.6,1.2,1.4,?,? seconds. - Loop sample lengths are (C1:C8): 1.0,?,?,?,?,?,?,? seconds. - Obviously very stretched, low and mid group transistions farily audible. - Stretch distances: 7,5,3,7,5,7,5(x3),6,6,5,4,7,11 = 15 groups. - Visible and audible velocity layer switch @ vel=94,116. - Both layer switches are fairly abrupt. - MP3 levels: peak @ -0.11dB, noise floor @ -63dB.